The AP US History course was re-designed in 2014 to focus more on historical thinking and analysis. The AP US History course h﻿as now been broken up into 9 specific time periods for students to focus from Pre-Columbian Native American groups to the Modern Day. 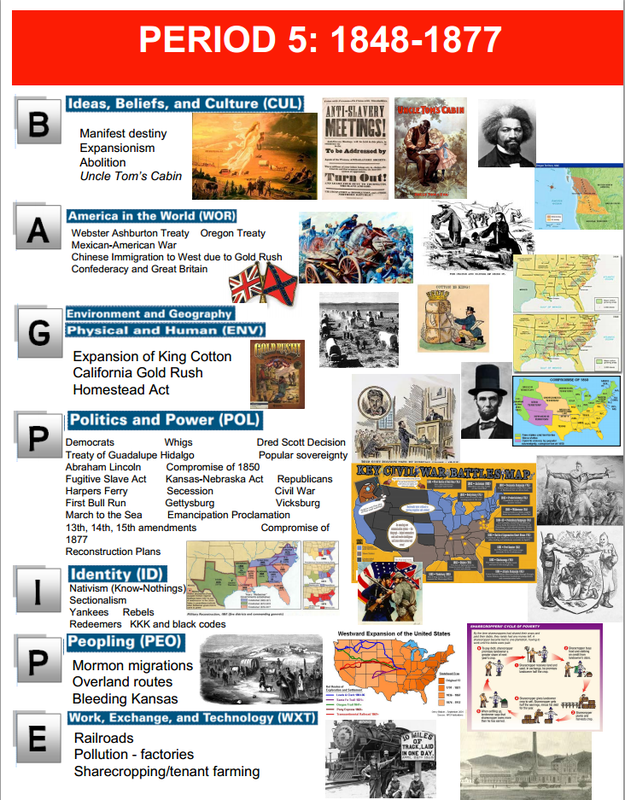 Historical Thinking Skills in APUSH: The curriculum framework begins by describing the historical thinking skills that are central to the study and practice of history. These are organized into four types of skills: chronological reasoning, comparison and contextualization, crafting historical arguments from historical evidence, and historical interpretation and synthesis. Teachers should develop these historical thinking skills with students on a regular basis over the span of the course. The historical thinking skills provide opportunities for students to learn to think like historians, most notably to analyze evidence about the past and to create persuasive historical arguments. Focusing on these practices enables teachers to create learning opportunities for students that emphasize the conceptual and interpretive nature of history rather than simply memorization of events in the past. 7. Appropriate Use of Relevant Historical Interpretation. Thematic Learning Objectives: The framework presents a set of learning objectives, organized by seven major themes that describe what students should know and be able to do by the end of the AP U.S. History course. 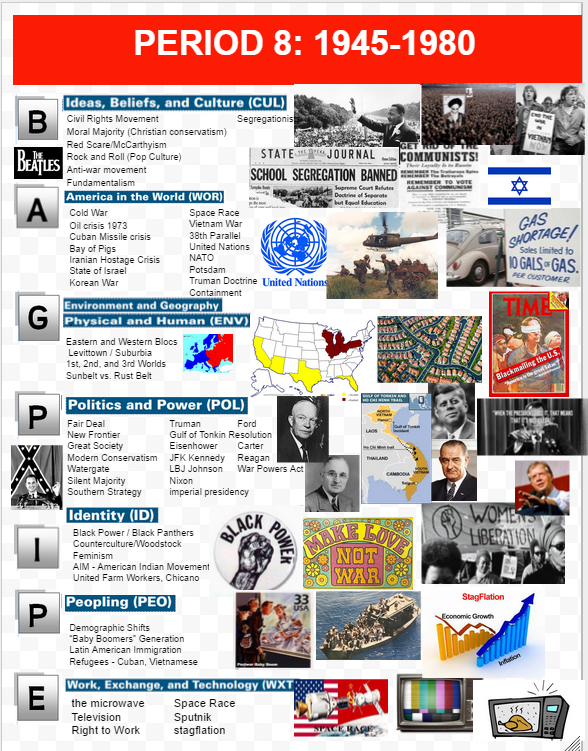 These represent the major historical understandings that colleges and universities want AP students to have developed in order to merit placement out of the introductory college U.S. history survey course. Students should use a range of historical thinking skills to investigate the thematic learning objectives. The AP U.S. History Exam is 3 hours and 15 minutes long and includes both a 105-minute multiple-choice/short-answer section and a 90-minute free-response section. Each section is divided into two parts, as described below. Your performance on these four parts will be compiled and weighed to determine your AP Exam score.